Always curious and ready for a new adventure, my business partner Paolo turned his Fiat onto a mysterious looking road, pressed down on the accelerator and began a perilously steep ascent towards a destination he promised would make this bumpy detour worthwhile. We were on our way to San Remo, the lovely Mediterranean town located in Liguria di Ponente (Coast of the Setting Sun), the section of the Riviera that extends from Genoa to the border of France. It was a crisp clear November day – perfect weather for exploring. Unlike the terraced groves of olive trees and lush vineyards we had just passed, this section was overgrown with weeds and tangled vines suggesting something secret and mysterious ahead. Or so my Hitchcockian imagination hoped! The faint sounds of music wafted through the air further piquing my curiosity. Eventually we spotted a village high in the rocky terrain – its jagged peaks piercing the blue cloudless sky. As we climbed the music became louder and clearer. Was it a concert or some sort of aural mirage? Were those truly horns tooting, cymbals clashing and tubas buzzing? Was it a warm up before a performance? Either possibility excited us both. Around the very last bend of the road (the turns getting tighter and tighter as we approached the top) imposing fortified stonewalls forced us to an abrupt stop. Cars could go no farther. We parked amongst a jumble of other vehicles and walked through a formidable stone archway to begin what turned out to be a journey into the past – essentially a visit to another century. Pigna, the name of the village, seemed untouched by time. Houses built one on top of the other gave it a haphazard appearance – like one giant labyrinth. We proceeded quietly trying to look as inconspicuous as possible (my rather fashionable attire was a dead give-away that we weren’t locals) and followed the music meandering through dark passageways into the center of the village. We came upon a typical Ligurian black and grey stone paved courtyard. Clusters of old villagers stood around the periphery chatting intimately; their tan, leathered faces reflecting what I imaged had been a very hard life. This didn’t feel like one of those famous perched medieval villages I had previously visited where tourists came to peek into ancient times, buy souvenirs at quaint little shops tucked into narrow, crooked streets and leisurely enjoy cappuccinos at charming cafés. In those villages it was difficult to imagine a past medieval existence. Here it was easy. Ecco (here) – finally the music. Pouring out of a narrow doorway above us was the band; all of its distinguished members handsomely outfitted in uniforms of dark navy blue and gold, carrying shiny musical instruments down the narrow steps into the courtyard. Young people were scarce – probably having abandoned this life for jobs in the city. But a few children chasing one another in circles at the back of the gathering crowd brought a sense of youthful merriment to the occasion. Paolo and I chose a prime spot on the ledge of a balcony just above the courtyard where we could not only enjoy the impending performance but also observe the people of this little village. For whatever reason these locals had chosen to remain apart from the rest of the busy, bustling world and instead maintained the simplicity of an era unknown to us except in the pages of history books. A very old man, his hand giving a sweeping reference to the band below, smiled at me and said, “Che Bella” (that’s beautiful). I nodded and immediately felt more comfortable. It was a privilege to have entered this world for even just a moment. It was a detour definitely worth taking. 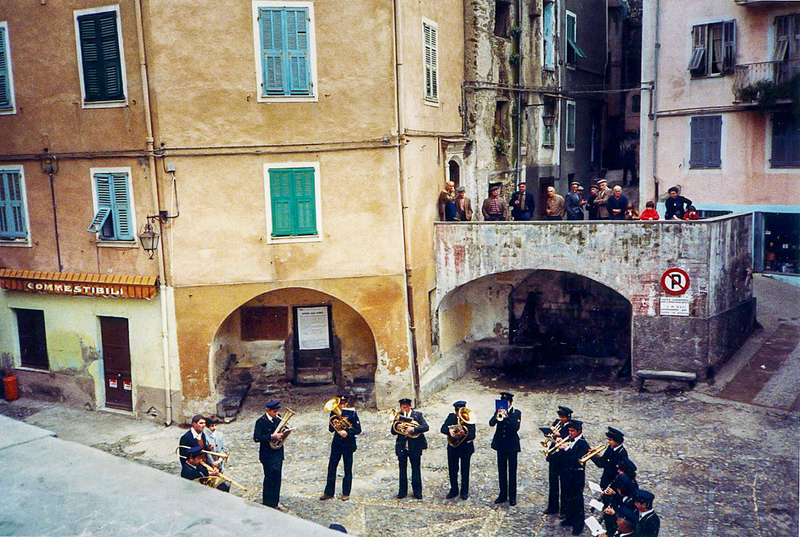 We left the balcony when the band stopped playing and walked further into the village. Cats and dogs scattered everywhere. What kind of life existed behind those closed doors I wondered? Was this life as austere as it appeared on the surface? Smells of olive oil and garlic penetrated the air promising a delicious midday meal though there was nary a restaurant in sight. These were the scents from the kitchens of the residents who were now slowly dispersing back towards the hidden dining rooms of their ancient homes. We left with a kind of reverence for the town and its people and – as a result of all those delicious savory smells – totally ravenous. It was time for our midday meal as well. We stopped at a small trattoria near Dolceaqua. Capponadda was the special of the day. At first I thought it was a new way to spell the popular Sicilian sweet and sour eggplant antipasto – Caponata – but soon learned that capponadda is actually a classic Ligurian dish said to have been created by fishermen – a dish easily assembled at sea using ingredients readily available on ship. Most recipes include sea biscuits (a very hard unsalted biscuit sometimes called hardtack and a staple on most ships), tuna, anchovies, olives, capers and sometimes hardboiled eggs. This version added tomatoes and cucumbers – two ingredients not available at sea. But all recipes evolve. Amazingly, the tomatoes were still summer succulent – even in November. But of course this was Liguria where all things seem to grow and prosper from the region’s bright sunny skies and warm sea breezes – even in its rocky soil. *Sea biscuits are also called hard tack, the only food taken aboard during long sea voyages. They are softened by water or vinegar and used in several classic seafood salads. We continued to discuss our “feudal experience” over lunch. Curious about the origins of Pigna, we paged through Paolo’s guidebook and to our surprise discovered that despite its tranquil and stark appearance, this was not a dying village after all. There were actually times of the year when it was transformed into a vibrant little town welcoming tourists from all over the world. In the spring and summer months, music festivals, plays and poetry readings were held within those ancient walls. What had we missed? Where were the charming cafes and quaint little shops? Most likely, we decided, they were shuttered. Winter was approaching and even though Ligurian winters could be mild, this village sat high in rocky terrain away from soft Mediterranean breezes. Experiencing a vibrant Pigna would require a return visit during the warmer months, but we were actually happy to have visited it during this quiet, more solemn time, to have – as guests – Pigna all to ourselves. No matter how many festivals it held, however, Pigna was not the fortified village it was designed to be. Protection was its original purpose – to keep vigil over the hinterland like so many of the other highly positioned villages in Liguria. It was a part of Liguria’s “double village” system where a second, more protected village was tucked into the surrounding mountains and could provide a safe haven for the townspeople living near the sea when barbarians selected them for pillaging. Like everything else in the world, Pigna had changed. Change, of course, an inevitable part of life, was key to its survival. Ligurians were masters at adapting. They adapted their very narrow strip of cultivatable land into amazing terraced ledges where flowers, herbs, olives and even some grapes prospered. They adapted to one ruler after another (because of their vulnerable position on the sea, invasions were commonplace and any number of countries had dominated them through the centuries). These ancient villages adapted to contemporary society by methodically adding electricity, phone service and other “new” services and in doing so made is possible for families to continue to flourish in the village of their birth, rather than losing all of their young people to the cities of Italy and greater Europe. They knew how to survive and adapt. They actually may be the world’s quintessential survivors. Convito was only a few years old and already we were changing – constantly trying to adapt our business plan to suite the realities of the marketplace while still maintaining our original mission. Always adjusting. Fortunately, I have never been imbued with a sense that permanence was my due. “Don’t get too big for your britches”, my dad would say. Right when you think you have everything where you want it, something unexpected comes around the corner challenging you to rethink and refocus. So I did just that. In the beginning Convito was the only game in town. There were perhaps a handful of places in metro Chicago that offered some of the things we did; fresh pasta, a great selection of high quality olive oils, fine Italian wines, freshly baked breads and a large assortment of ready to eat, ready for take-out foods. But there were none outside of downtown and none that did it as well as we did (in my opinion that is!). Soon after our opening, however, a plethora of Italian products hit the market. Fresh pasta became available in refrigerated sections of high-end grocery stores. Fine Italian wine was quickly discovered and included in selections of the best wine and liquor stores all over the city. Specialty bakeries could be found on every corner. And prepared foods became the new hot thing. Slaws and potato salads were not the only items listed on deli menus. 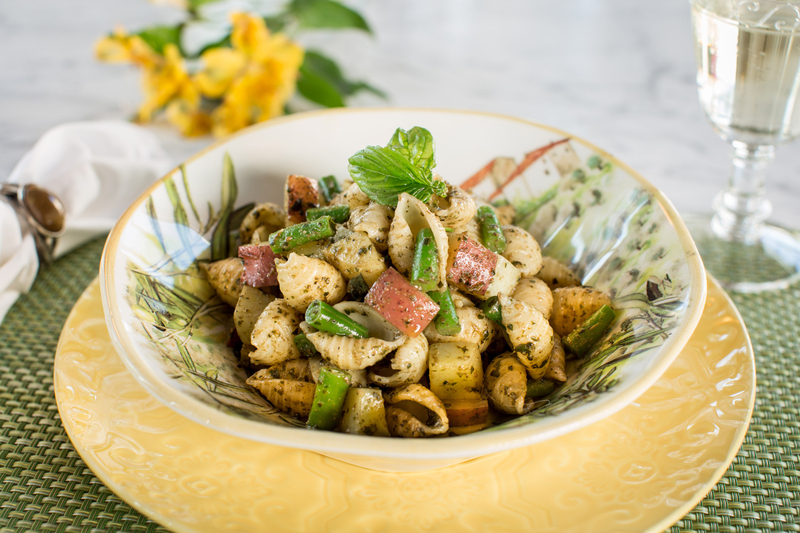 Pasta salads, soups, roasted chicken and any number of ready for take-out dishes and complete meals recently named “grab-&-go” joined them. We adapted and changed our priorities. We emphasized our frequently praised and original prepared foods, we increased our selections (we introduced a soup bar with 28 different varieties), we promoted our “developed in Italy” sauce selection, we expanded our groceries to include excellent products not only from Italy but also from America and other countries around the globe, we enlarged our 24 seat trattoria to 60 seats. We also opened new locations. For 34 years we have been changing and adapting, adding and subtracting. Like the citizens of Liguria, we are constantly changing to fit the times, which has been tantamount to our continuing success. Beyond simply keeping us in business, I believe change in and of itself is good for the soul. It has kept Convito relevant and stimulating both to our customers and to me. Paolo and I continued our discussion of change throughout the weekend. Our destination, San Remo, is known as La Citta dei Fiori (the city of flowers). Flowers clung full colored to the rocky walls lining the roads. Like olive oil, the flower industry is a very important part of the region’s economy. Greenhouses filled with carnations and mums appeared above and below us intertwined with the frosty green leaves of olive trees. We arrived in San Remo late in the afternoon. Before checking into our hotel we took a leisurely stroll down the lovely palm-lined streets just before dusk when the failing light of the sun cast a dusty-rose pall over this lovely city. The streets were still teeming with people. We stopped for a quick espresso then did some serious window-shopping, one of my favorite pastimes. We decided to buy some items at one of the local food shops for our trip back to Milan the next day. I selected an assortment of savory cheeses and meats and two slices of an appealing looking tart displayed on a lovely glass pedestal plate. It was a Pasticcio di Zucchini ( zucchini & rice tart). Ligurian cooking uses an abundant amount of herbs. 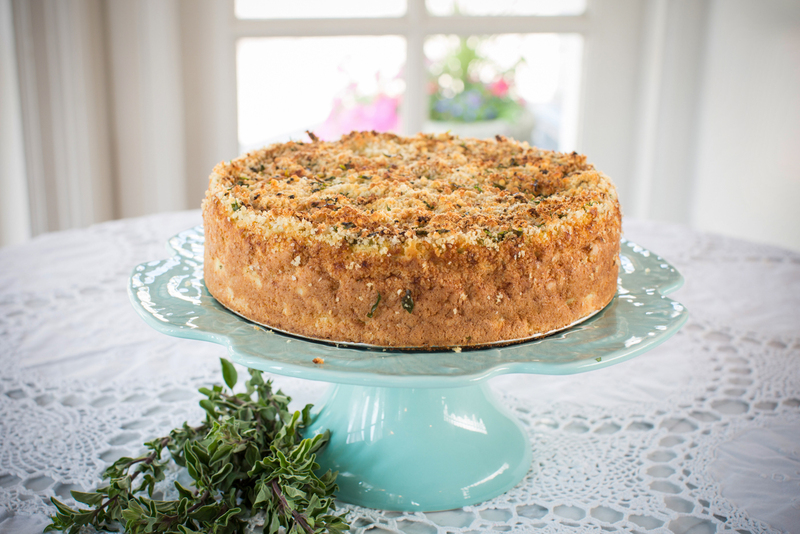 This particular tart contained marjoram one of the most commonly used herbs of the region. Wanda and I tried to duplicate the taste in her apartment kitchen after I returned to Milan. Following is the resulting recipe, which always brings me back to that day in San Remo. In a small saucepan bring the water and milk to a boil. Add the rice and simmer for approximately 12 minutes until al dente. Set aside to cool. Do not drain. In a small sauté pan melt the butter with the olive oil over medium heat. Add the onions, garlic, marjoram and parsley and sauté until onions are golden brown about 8 minutes. Set aside. Place the shredded zucchini in a large bowl. Add the rice and remaining liquid, the onion mixture, ¾ cup of the parmesan cheese, eggs, pinch of nutmeg, salt and pepper. Mix well. Butter the bottom and sides of a 10-inch spring form pan with half of the butter. Sprinkle half of the breadcrumbs to coat the bottom and sides of the pan. Pour in the zucchini mixture. Top with the remaining breadcrumbs and parmesan cheese. Then dot with the remaining butter. Bake in a 350-degree oven for 45 minutes. Place under a broiler for an additional 2 minutes to brown the top of the torte. Let cool, release spring form, slice into twelve portions and serve at room temperature. This summer, Neko (my son’s daughter – my granddaughter) came to stay with me. She loves to help me cook. 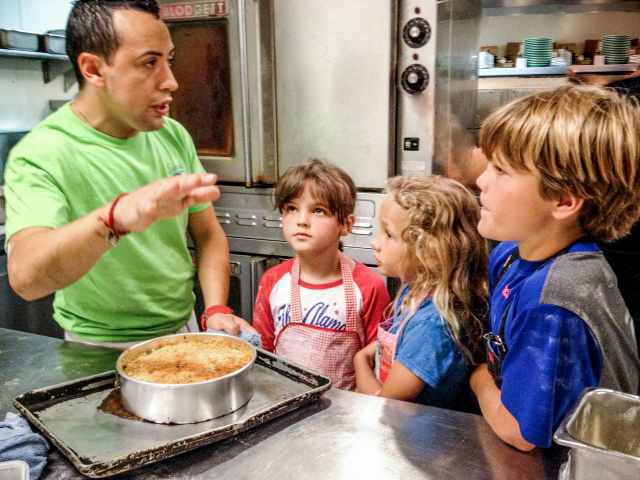 I decided to take her to Convito with Kingston and Kianna (my daughter’s two children and my grandchildren) for a cooking lesson. Chef Noe was a great instructor. We tested the zucchini and rice tart and many other things like potato gnocchi. (4th grandchild Isis was too little but we’ll include her in our next session) They helped to make the zucchini and rice tart. The recipes in this blog are from a variety of sources – mostly recipes I tested with Wanda in her Milanese kitchen or sketchy journal entries of dishes I tasted during my journeys. All of them are tested again in my Convito kitchen with Convito Chef Noe Sanchez. Once we are happy with the results, Rob Warner, my son-in-law and food photographer at http://www.warnerfoto.com photographs them. I act as his “stylist”. That night I had one of the best meals I have ever eaten in Italy. We dined in a quiet little white-table-clothed restaurant that had been recommended by a friend of Paolo’s. The meal began with a dish Paolo claims he had never seen on a restaurant menu – totally rare and unexpected. We both ordered the Cappon Magro, an incredibly time-consuming dish to make. It is not complicated but boasts an elaborate catalog of ingredients and is most often seen as a gothic masterpiece in center of a grand buffet, rarely as a single dish. Cappon Magro means “fast-day capon”. Like so many stories about the origins of old Italian recipes, versions vary. But most stories agree that it is a fairly ancient recipe served as a meatless dish on Christmas Day. The Cappon part is thought to be an ironic reference to ‘Capon’ which is what is served on rich people’s tables, not on the tables of those less well off. Since the dish contains no meat, it is appropriately served for traditional Catholic fast days including Christmas Eve. 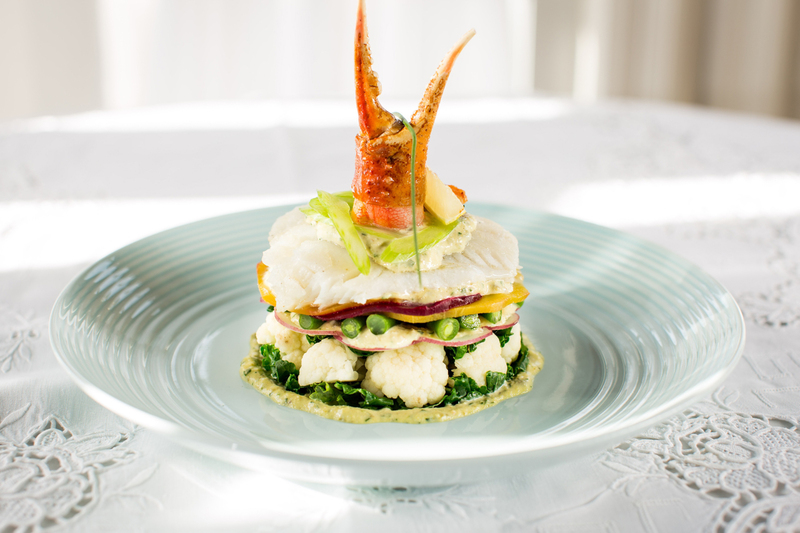 It is a complex vegetable and fish salad that traditionally is layered into a pyramid. The kind of vegetables and fish vary from one recipe to the next. The sauce, however, is fairly consistent. The sauce recipe follows. In a food processor, place the olives, capers, anchovy fillets, eggs (both raw and hard boiled), parsley, garlic and pinenuts. Process. Add the vinegar soaked bread and process again until smooth. Slowly add the olive oil until a thick creamy mayonnaise had formed. 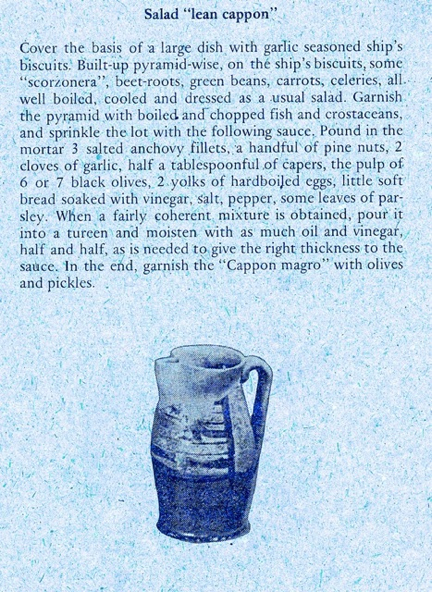 My favorite version of Cappon Magro (below) is translated from a recipe in Liguria in Bocca, one of the books in a series of regional Italian “in Bocca” cookbooks whose translations always make me smile! 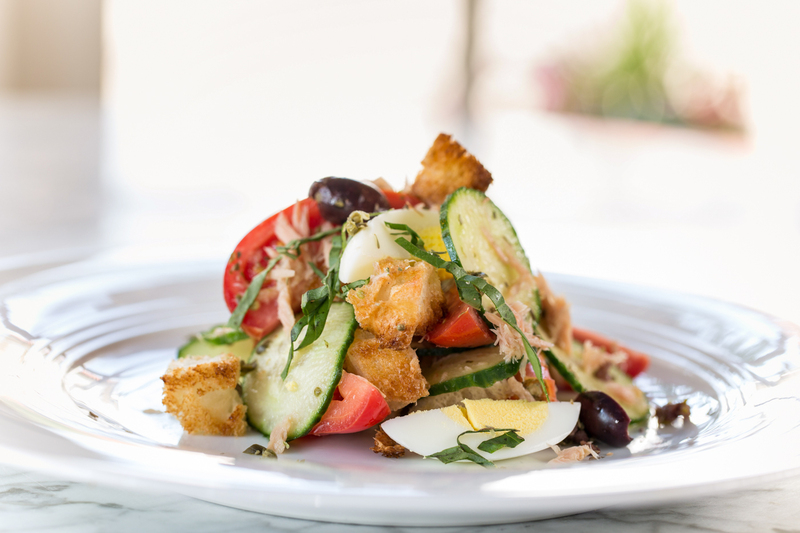 Note: I have never made this dish as a buffet centerpiece but rather as an entrée luncheon salad – or the main course for a summer supper – with bread and a glass of white wine it is unparalleled. The rest of the meal was also sensational – spaghetti with a fresh tomato basil sauce (probably not to be duplicated anywhere but Liguria because of the unique taste of this area’s basil), succulent browned grilled lamb chops (pink center), and the finale – zabaione – a Piemontese creamy custard-like dessert made with egg yolks, sugar and Marsala (a fortified sweet wine from Sicily). All courses were delicious but it is the cappon magro that lingers in my memory to this day. 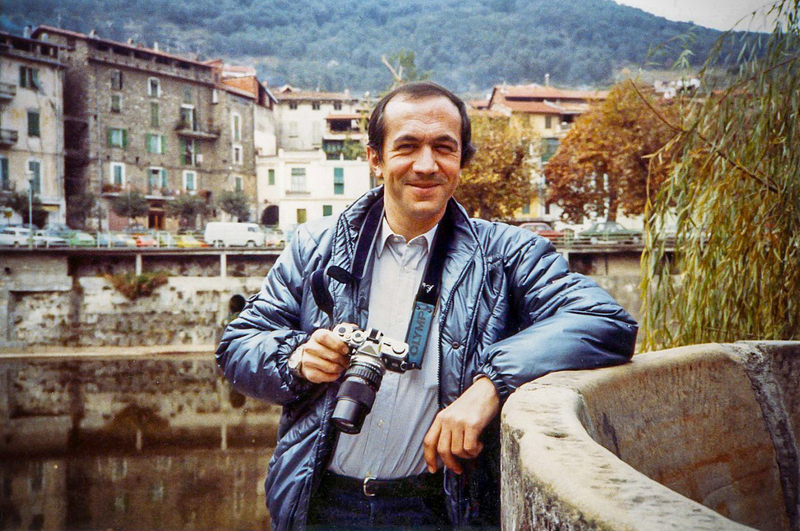 I would return to San Remo one more time in January of 1985. Even though meteorologists were predicting severe winter weather all over Italy, the Riviera would be fine – or so we thought. Again Paolo and I left Milan early in the morning. As we approached Genoa the wind increased and as we drove we began to notice snow dusting the higher reaches of the terrain outlining the irregularities of the Ligurian landscape. But the snow disappeared as we descended from the highway down to the sea. Close to San Remo we stopped for a late lunch at a typical trattoria just at the outskirts of the city. The restaurant was still donning its “Christmas look”. Shimmering silver garlands were draped over the bar, pink and blue sparkly ornaments hung on a rather ratty looking fake tree in the corner of the room and colored Italian lights framed each window annoyingly blinked on and off throughout our whole meal. There is something so sad about Christmas decorations after Christmas is over. Especially in late January! We ordered a glass of local wine – Pigato, a fragrant, earthy white. I brought along an assortment of press reviews from the newly opened Convito Chicago location for Paolo to see. We had been open for only a few months and Paolo had not been there since our November opening party. Sipping our wine, we paged through the articles. They were great. He was impressed except for the bit in what otherwise was a glowing review – about one particular pasta dish that the reviewer claimed was NOT al dente. Pasta NOT al dente is a sin to most Italians. I had no idea when the reviewer was there but I assured Paolo that NOT al dente was an exception at Convito. And yes we did understand the concept of al dente – “to the tooth”, perfectly done. I am as paranoid as he is about that subject. The wind was picking up. The sky was getting darker and gloomier. We decided we had better order lunch. Paolo selected a fish with lemon and rosemary and I a typical Ligurian pasta dish with potatoes, green beans and the sauce of the area, pesto. Often in Liguria trenette is used by I prefer a short cut pasta. The drive back was horrendous. What normally was a two hour drive took seven. Every few miles brought a new crisis. First it was the wind whipping in all directions making visibility increasingly difficult. The expansive motorway from the Riviera to Milan alternates between tunnels and viaducts. Usually one looks forward to the areas outside of the sometimes very long, dark tunnels (gallerias) where one could catch a glimpse of the rocky terrain and maybe even the sea but for this trip, we instead looked forward to being inside the tunnel. They acted as cocoons, like blankets to momentarily escape the howling wind and the blowing snow. The right lanes in the gallerias became rest spots for some cars, for others a place to pull over and put chains on their tires or sometimes just to clean the snow and ice off windshield wipers, side mirrors and headlights. The next crisis was darkness. We crawled – not the usual famous driving of the great Paolo Volpara. He became very “white-knuckled-quiet” except for an occasional statement like “We have no traction!” “The snow is piling higher. “ “I can’t hear the engine.” Or the best one – “We may go off the road at any minute!” Yikes. Every muscle in my body was tight as a drum. Police cars and ambulances patrolled the mountains, their blue lights flashing in the darkness. Huge snowplows tried to make a dent in the pummeling snow. Impossible. I felt like I was in a science fiction movie. Finally we saw a sign – 50 kilometers to Milano. At least we were close and out of those gallerias, we thought. But the next crisis was the really slippery roads – a sheet of ice under all the slush making each turn of the wheels dangerous. It felt like an eternity. We arrived back in Milan at around 10 pm. We had been driving since 3:00 p.m. Paolo dropped me off at my hotel without saying much of anything – just a wave goodbye. He deserved a medal! At the very least a stiff drink and a hot bath! It was days before I could fly out of the Malpensa airport back to Chicago. Everything was shut down. Milan was covered in a thick blanket of snow. The snow continued. Parked cars were completely covered. It was a snowstorm – THE snowstorm of 1985 – that paralyzed many parts of Italy. After 25 snowless winters Rome became paralyzed, forcing airports to close and bringing this incredible city to its knees. The papers were filled with stories of abandoned vehicles on the highways, olive crops in Tuscany severely damaged – vineyard too. Milan surrendered. Schools were closed; icy roads were full of huge holes from chain spinning wheels. Many parts of Italy were declared national disasters. I spent the next 5 plus days checking flight schedules out of Malpense – always disappointed. The airport remained closed! I searched in every store close to my hotel for snow boots. They were impossible to find. I settled for wet, frozen feet. I mostly lunched in the hotel alone (Paolo had managed to get out of town for a client meeting and Wanda was too far away from my hotel to venture out into the snow), Fortunately my friend Roberta Lai met me for dinner several nights including one where we hit the jackpot. The manager of the restaurant we had chosen introduced us to a man who would eventually become a close friend – Luigi Lazzaroni of Amaretti fame. We were essentially the only customers in the restaurant so once we were introduced, we talked for hours. At the end of our dinner Luigi (Gigi) promised to send a car into Milan the next day to bring us to nearby Saronno for a tour of his factory. To our amazement he did – tire chains and all. (An adventure and a story for another blog). I would eventually get out of Milan – but not by air. I joined hundreds of other stranded travelers on a train to Zurich (standing all the way) and flew home to Chicago from there. It was a crazy trip – like so many of my trips to Liguria had been. “Normal” did not seem to accompany me in this region. From the ominously dark day when I walked along the edge of the sea down to the rocky peninsula in Portovenere; to our discovery of the ancient medieval village high in the Ligurian hills; to the snowstorm of 1985 – Liguria, for me, is full of surprises. A region of marvel and mystery. I have experienced the sun, the beaches, the warmth of this great region – and those experiences are a great part of my journeys – but like so many ventures in life, the ones that are totally unexpected are the very ones that often linger the longest and have the most meaning! Liguria, you are for me the best! I am the owner of an Italian café and market in Wilmette, Illinois, a suburb on the north side of Chicago. The original Convito Italiano was opened in 1980. It included a deli, bakery, prepared foods, groceries and wine. Today it is renamed Convito Café & Market and has expanded to include an 80 seat restaurant. In preparation for launching my business I wanted to learn as much as possible about the food, the wine and the culture of this country I so came to love. I had the good fortune to have extraordinary teachers, Milanese residents and future partners Paolo Volpara and his mother Wanda Bottino. 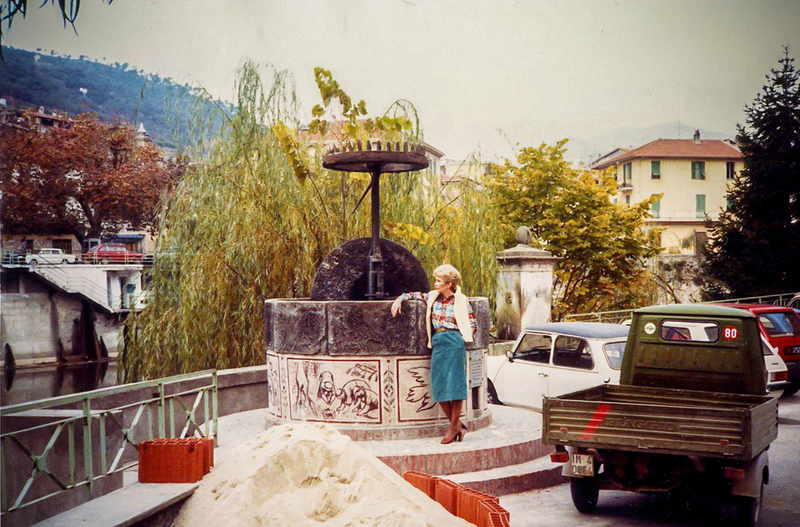 During my frequent travels from 1979 to 1986 I was able to cook with Wanda in her small Milanese kitchen during the week then travel to different regions with Paolo on the weekends. I continue visiting Italy to this day but this was my time of total Italian immersion. It was the beginning of an adventure that carried me to the four corners of Italy and every region in-between. It was also the beginning of another kind of journey – a personal one that opened up possibilities I never considered or knew existed. It was a heady time for a girl brought up in the fifties. This entry was posted in Uncategorized and tagged Cappon Magro, capponadda, Convito, convito cafe and market, Italy, Liguria, nancy brussat, paolo volpara, Pasticcio di Zucchini, pigna, san remo. Bookmark the permalink. Wow Nancy. You’ve painted a beautiful picture of Italia I never thought existed. Well done lady. Great writing and descriptions of the area, villages, the people, the food and the surprising winter weather. Who knew? Wonderfully told adventure. Delicious discovery with a storm on the tail. and all the “unexpecteds” were so much fun to read. ” We may go off the road at any minute” was really hilarious–in retrospect to you, I’m sure. What a wonderful chapter Nancy! I so enjoy reading your wonderful blog.